Finding Her Balance. A piece for the De Patta Project at Velvet da Vince. San Francisco, California. An exhibition inviting artists to create work based on selected stones and pebbles from the estate of Bay Area jewelry pioneer Margaret De Patta. 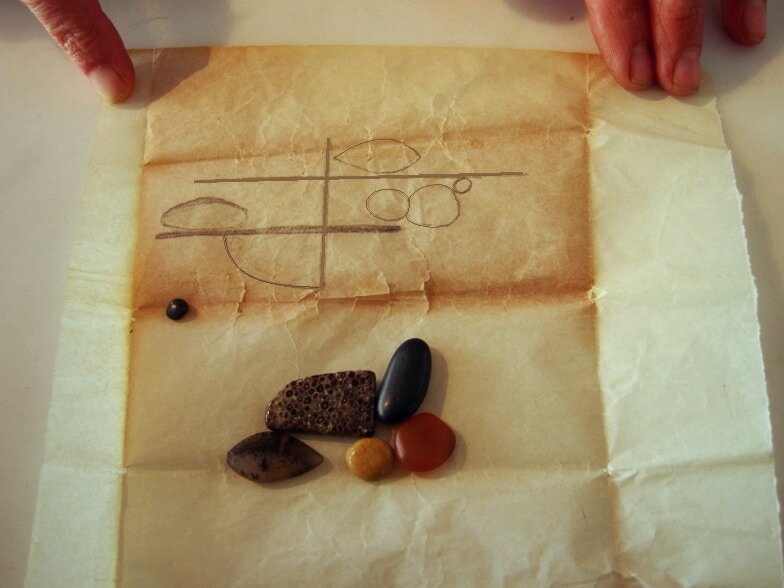 Margaret De Patta stones, pebbles with their original drawing. I chose this collection of stones because they were nestled together and folded within her sketch - an unfinished plan from a life cut short. Margaret committed suicide in her 60's. She exhaled her life in the middle of a sentence and I was drawn to the idea of finishing this piece for her. 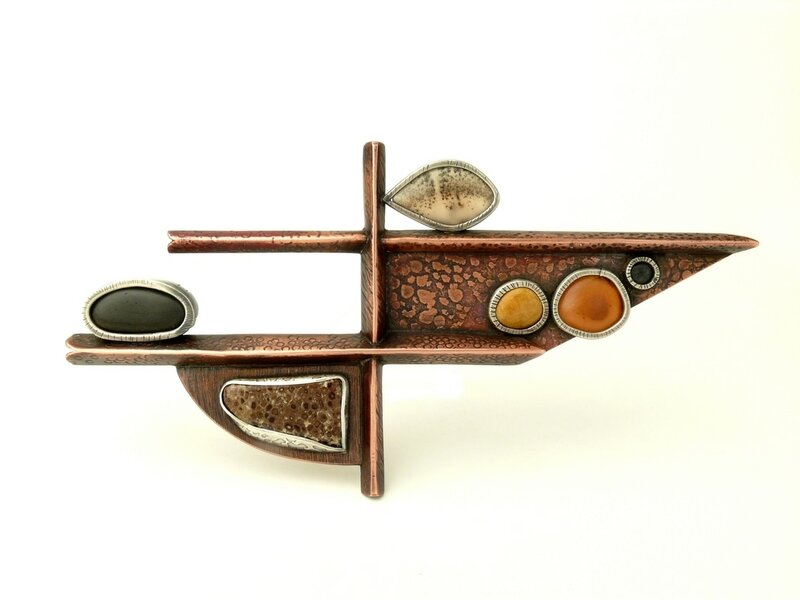 Margaret De Patta Brooch, 1950's. My respect for this artist is great, but I work much differently. Where she is light, I am shadow. Where she is air, I am earth. ​I really struggled and beginning was difficult. I retreated and went to the source to translate her drawing into my own language. 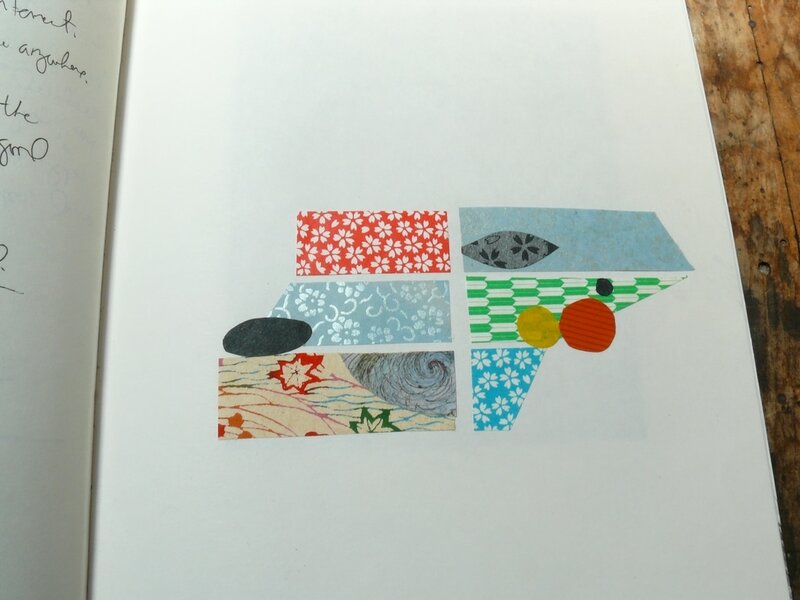 When I made this collage, I realized her sketch was about balance. I knew how to begin. Finding Her Balance. Copper, sterling, De Patta stones and pebbles. As she was looking over my shoulder while I worked, I don't think she was happy channeling my hands. But we had a dialogue throughout the process - me compelled to explain that the piece had to reflect me as well. I think we ended on good terms. Her balance and my shadow.